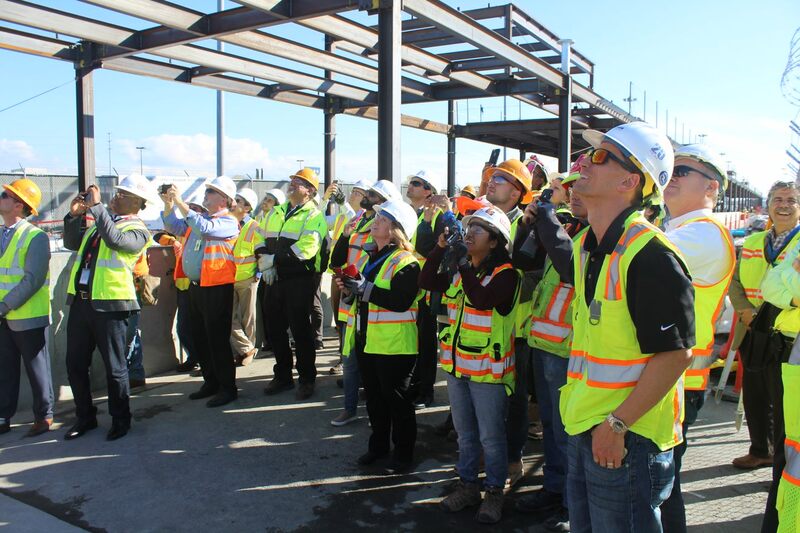 Officials at Mineta San Jose International Airport (SJC) in California celebrated as the last piece of structural steel was erected as part of the new Interim Gates Facility (IGF) project. The setting of the last piece of steel on the structure represents a significant milestone for the Fentress Architects and Hensel Phelps design-build team, which broke ground on the project three months ago. The facility is on schedule to open in summer 2019. The IGF will provide the airport with an additional five gates with passenger boarding bridges and a sixth ground-loaded gate, to help accommodate SJC’s passenger growth over the past four years. For 2018, the airport expects to serve 14.3 million passengers, a 52% increase in traffic since 2014. The US$58m interim facility is being constructed and connected to Terminal B on the south end of the airport. It will provide seating for 550 passengers and offer concession space and restrooms. Fentress’s design for the state-of-the-art interim facility includes an exterior with contrasting light and dark corrugated metal panels and clerestory windows on the landside façade, maximizing the use of natural daylight. The facility’s interior incorporates acoustic wall panels to create a warm and comforting passenger experience.